Th-INK-ing of You: Walk with God and some exciting news! Hello everyone! I hope your week is going well! Today I have a card to share that uses two of the newest Our Daily Bread designs sets. 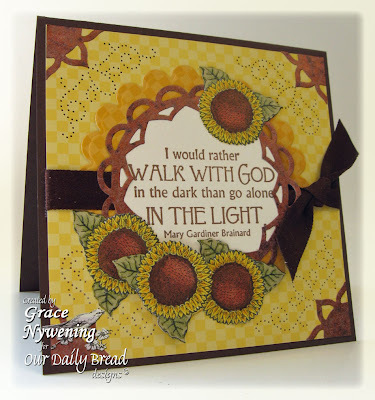 The sentiment is from a set called "Light", which is part of a new series called Full of Grace. The sunflowers are from Happy Fall. The GREAT thing about cutting these sunflowers out is that I used one of the new dies Kelley is carrying! I LOVE them! This one is the Small Sunflower Die. They come with a clear pattern of the die which you line up with the flower, and then you mark the two little circles with a pencil dot. Then you use the die itself, placing the two circles exactly on your pencil marks and voila! Cut in seconds and amazingly close and perfect!!! I just can't say enough about these dies! I was going to do a tutorial on these but Betty already did a great one so I'll link hers here for your ease in understanding. Be watching the ODBD Store as more of these dies become available... you are going to WANT these if you want to make intricate cuts in seconds!!! Talk about the possibilities when it comes to paper tole!!! My inside circle is cut from coppery paper with a Nellies die and the center cut out on that multi is then cut in fourths for my corners. I thought that center piece looked a lot like a sunflower so I wanted to use it. Announcing the Grand Opening of Laura Kirste Campbell's new line of digital stamps offered exclusively on Squigglefly! Announcing the arrival of a brand new product...original, hand-drawn digital stamps! Expanding Layers of Color art stamp line with an entirely new look in a fresh hip style! Squigglefly, a popular digital website is announcing their newest artist, Laura Kirste Campbell! But there is a very special purpose above and beyond these exciting facts that give this new direction personal meaning for the artist. Laura is donating 100% of her Squigglefly profits directly to The Theological Biblical Academy, (TBA). TBA trains pastors and church planters who will establish and lead biblical churches in Croatia and the bordering countries of Slovenia, Bosnia-Herzegovina, and Serbia. This is the ministry of her dear friend, Nina Brackett, who is also a Squigglefly artist. This is not only a way for Laura to lend support, but also to give thanks to God for gifting her with talents and her art business, Layers of Color. Please stop by Squigglefly, visit Laura's "about" page, and help support this wonderful ministry by choosing several delightful digis! And may God be glorified through us all! Is it any wonder I love working for Laura? Her Christian testimony shines through every word she speaks and I just think this is such a wonderful "cause" to contribute to, and I hope you'll stop by and see her brand new gallery! Thanks for reading this far!!! Thanks so much for stopping by! Have a blessed week! Oh my GRACE this is sooo pretty, I LOVE the sunflower theme...JUST PERFECT!!! Nice web / I hadn't see th-ink-ingofyou.blogspot.com before in our searches! Drive up your good work! Beautiful card that shines with faith! God bless your day today, Grace! Gorgeous card. I love the sentiment that you used. I see Ricky is a very happy cat. You'd never guess that he is 16 1/2. Thanks for joining us at I Did It Creations. This is gorgeous! That die is fabulous, love the paper piercing too. This is sooo beautiful, Grace! The coners accesnts are just so perfect with these sunflower images! Thank you, Grace for adding the digi announcement to your post! God bless you! Oh so beautiful! I love the colors you used. I also really liked what you shared - good health is such a wonderful gift that I often take for granted. Thanks! Love this Grace - so bright and happy and the piercing is awesome!! !